When you're tired of playing online, why not take a break with the FIFA 19 Squad Battles? This is an offline mode where you can play against the AI and grind your way up the leaderboards for rewards, including a loan Ronaldo. Not bad, right? We've got a complete guide to the offline mode in FIFA 19 right here, so you can earn some top Ultimate Team rewards in FIFA 19 Squad Battles. What are the basics of FIFA 19 Squad Battles? It's actually really, really simple. Each week you play between one and 45 games against the AI, on varying degrees of difficulty. Then at the end of the week you’re rewarded for your performances as well as results. Points are awarded for achievements such as goals and clean sheets, in addition to wins and draws. A key risk-reward wrinkle is being able to choose your difficulty setting before each match, with more points on the line if you win on Ultimate or Legendary – and an even deeper pang of pain in your stomach should you lose and come away with sweet FA. What time do FIFA 19 Squad Battles refresh? Every weekday you can play one set of fixtures, which equates to four games. And you can catch up with up to three fixtures from a previous set, so long as you’ve already played one the day before. Let’s say you play no games on Monday, one game on Tuesday, and then settle down for a mammoth FIFA session on Wednesday. Monday’s games are lost forever, but so long as you avoid hitting ‘Refresh Opponents’ you can still play the remaining three Tuesday games. Only then would you select ‘Refresh Opponents’ to trigger Wednesday’s four games. Weekday fixtures refresh at midnight UK time. At weekends you can play three sets of fixtures per day, which refresh at eight hour intervals. Again this same rule re fixture sets applies; the maximum number of games you can play in any session is eight – four from the current eight-hour slot, three from the previous one, and that week’s celebrity fixture, which sees a real-life pro or well-known community member provide a team for you to come up against in a one-off match. Weekend fixtures refresh at 8am UK time, then again at 4pm UK time. How do FIFA 19 Squad Battles leaderboards work? How can I get the best FIFA Squad Battles rewards? TL;DR answer: play all 45 games and win as many as possible on Ultimate difficulty. More detailed, and realistic, answer: accept that a top 100 placing is highly unlikely unless you’re close to the level of an eSports pro and/or have an all-Icons super squad. Also understand that the computer does infuriatingly cheaty things on Ultimate difficulty. I scored 749 wins online and offline in FIFA 18 Ultimate Team, with a win percentage of 87%, yet never won a Squad Battles game on Ultimate difficulty. I had multiple leads of 2-0 or 3-1 but my team would always turn useless, and the opposition superhuman, in the last 20 minutes. My tip, then, is to play every game on World Class difficulty while you’re building your dream squad and/or confidence, then switch to Legendary difficulty once you’re reeling off the World Class wins. Elite 1 is still a challenge under these circumstances, but after a month, if not a fortnight, you’ll find yourself regularly securing Elite 2 or Elite 3 finishes. That’s sufficient to secure at least 12000 coins and three monster gold packs – and the nature of packs being random means that while the top 100 rewards appear sexier, you can just as easily score big-name players from the Elite tiers. For instance, my Squad Battles packs so far this season have included Mauro Icardi (87), Thiago (86) and Virgil van Dijk (85), to name three. When do FIFA 19 Squad Battles weekly rewards come out? Squad Battles rewards drop shortly after midnight UK time on a Sunday night/Monday morning. They’re available both in game and via the web app (more on which in our FIFA 19 Web App guide). 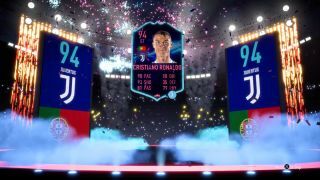 Because they’re mostly gold cards this has a huge effect on the transfer market over the following 24 hours, which you should bear in mind when using another of GR’s guides – this one on making FIFA 19 Ultimate Team coins. Monday is therefore a terrible time to sell, because everyone is looking to offload their unwanted reward cards, but a brilliant window in which to buy, precisely for this reason. Desperation sellers = lower prices = a perfect time to cherry pick your most desired players. Are there FIFA 19 Squad Battles monthly rewards? No. Barring a sudden and highly unlikely change of policy midway through the FIFA 19 life cycle, Squad Battles rewards are weekly. What are the minimum points I need for FIFA 19 Squad Battles rewards? One point. Although so far as I can ascertain it’s actually impossible to get one point. If you play one Squad Battles match in any given week, you are guaranteed to earn the minimum Bronze 3 award, which at time of writing [November 2018] is a Premium Loan Player Reward pack and special edition kit. FIFA 19 is out now. Planning on picking it up sometime between now and Christmas? Then be sure to check out our 9 essential FIFA 19 tips to know before you play.